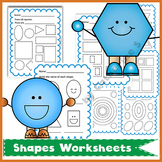 2 work sheets on shapes.Vocabulary: shapes, colors, square, circle, triangle, rectangleSimple images and language. 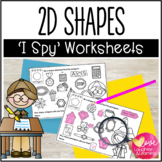 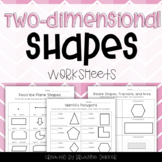 Two Dimensional Shapes Six Worksheets! 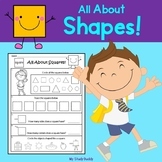 They include: -Identify shapes -Draw your own shapes -Name shapes and how many sides -Name shapes and how many vertices -Name shapes and how many angles -Quadrilaterals vs Non quadrilaterals Can be used in K, 1 or 2! 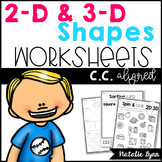 Common core state standards! 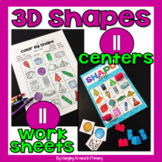 2.G.1, 1.G. 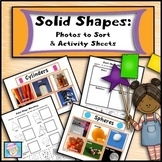 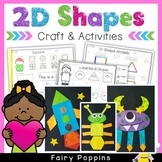 SOLID SHAPES ACTIVITY PACK: OVER 40 PAGES OF FUN WORKSHEETS AND ACTIVITIES! 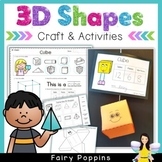 This MEGA RESOURCE PACK, containing 43 pages, is an ideal resource for children learning 3D shapes (cone, sphere, pyramid, cylinder, cube and rectangular prism)! 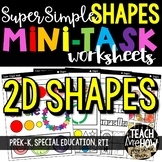 Basic to more complex printables are included in this pack.